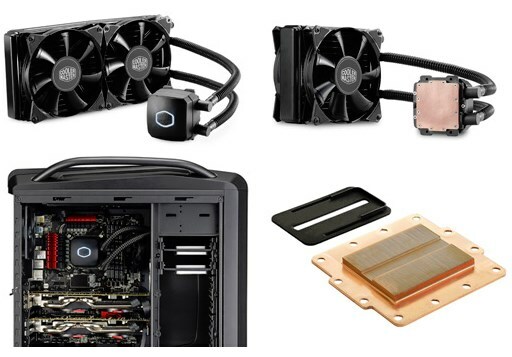 Cooler Master, an industry leader in the design and manufacturing of premium PC components and cooling, today introduced yet another unique All-in-One (AIO) watercooler series, Nepton 140XL / 280L. Each features a pump with an exclusive Cooler Master design that maximizes performance and flow. Nepton 140XL and 280L both are factory filled and sealed for immediate installation and maintenance-free operation for years. Affixed to Nepton 140XL and 280L are premium JetFlo 140 Series fans that are built specially for the high air pressure and heat dissipation required for high performance watercooling. For greater cooling compatibility, JetFlo 120 Series fans and other 120mm fans are supported via compatible mounting holes on the radiator. Nepton 280L comes equipped with dual JetFlo 140 fans and an extra large 280mm radiator that, together, generate substantial cooling power that can dissipate up to 300W of heat. This, coupled with a pure copper base, means Nepton can handle high CPU overclocking. Longer and thicker FEP tubing assists in maintaining exceptional performance through less restrictive water flow and superb evaporation resistance. The struggle is over; Nepton 140XL and 280L include specially designed thumb screw based mounting kits for the fans and pump. No longer will your installation be bogged down by unnecessary mounting steps and tool requirements. All that you need to install the Nepton 140XL or 280L are your fingers. Step into a new world of watercooling with user-friendly installation and usage and high performance cooling. The Nepton 140XL & 280L will be available in November. Price and availability may vary based on region.